Gov. 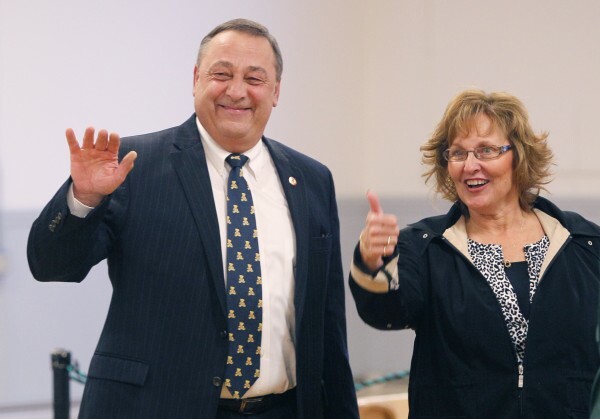 Paul LePage and his wife, Ann, acknowledge well-wishers before voting in Waterville in November 2010. BOOTHBAY, Maine — Gov. Paul LePage and his wife, Ann, have purchased a home in Boothbay, where they’ll move after they leave the Blaine House. Ann LePage told the Bangor Daily News on Thursday that the couple paid $215,000 for the home, which had been in foreclosure. The Boothbay house is a 12-year-old colonial with three bedrooms, 2.5 bathrooms and a two-car garage, according to town records. The couple will continue to live in the Blaine House as long as Paul LePage holds the office, Ann LePage said. Paul LePage, a Republican, is running for re-election this year against Democratic U.S. Rep. Mike Michaud and independent candidate Eliot Cutler. The purchase of the Boothbay property — valued at about $355,000 and located off Back Narrows Road with access to the Damariscotta River — marks the first time in four years the LePages have owned property in Maine. The LePages sold their Waterville home three weeks after the 2010 election, Ann LePage said. The LePages’ residency has long been a matter of contention among some partisans. Democrats have criticized the governor for not owning property in Maine, saying it insulated him from feeling the effect of his cuts to municipal revenue sharing, which many towns and cities have said resulted in higher property tax rates. That’s not the first time Paul LePage’s residency has been questioned. When he ran for governor in 2010, questions were raised about why the LePages were getting tax breaks on their homes in two states by claiming primary residency in both Florida and Maine. LePage’s campaign said it was simply a paperwork error, and the couple ultimately repaid the roughly $230 in taxes owed on their Waterville home. The LePages searched the coast and nearly purchased homes in Calais and Harrington before finding the Boothbay property, Ann LePage told the Lincoln County News, who first reported the sale. “We just found a great piece of property at a great price, and frankly, who wouldn’t want to live in Boothbay?” she said. While her husband remains in Augusta, Ann LePage will continue to spend the winter months at her home in Ormond Beach, Florida, where she takes care of her ailing mother.